STOP! Read This Before Starting Your Deck Project! These deck design tips may save your project, so take the time to read carefully. Print this page, take notes, use your highlighter, do whatever you need to do, but keep these deck design tips handy as you go through the planning process. As you proceed, come back to these and make sure you're still on track and that you haven't forgotten anything. Some of these tips may not apply to your particular situation, and you probably won't want to use every one. Or maybe you don't have the budget for some of these. But I don't want you to get your deck built and then say, "Awww, man! I wish I had thought about that earlier!" Instead, I want you to stand back, smile, and say "It's perfect! It's just what I wanted!" In fact, I want it to be better than you imagined. That's the reason for this list of deck design tips. Actually, that's the reason for this entire site. Think of your deck design process like you were planning a room, or a couple of rooms. Think of what furniture you plan to use. Who will use the space and for what? How many people are likely to be there at once? Allow space for standing around and walking. Your first decisions are basic, but not always easy. And these are places where the first mistakes get made. If this part is wrong - its hard to make the end result come out right. So take your time and think through this part. And as always, keep the whole backyard design idea in mind as you plan your deck. You'll want it to blend in with the overall concept once everything else is in place. 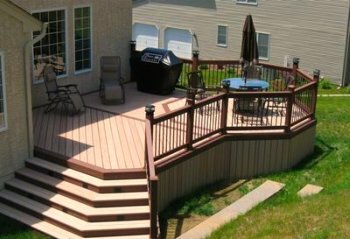 Since this is often a process that takes place over time - usually years - you will need to take a very wide, big picture look before finalizing your deck design. These deck design tips are an effort to get you started - and to stay - on that right track. What size does your deck need to be? I've never heard anybody say, "I sure do wish I had built this deck smaller!" or "I hate all this space on my deck!" Nope, it's never happened in my experience. 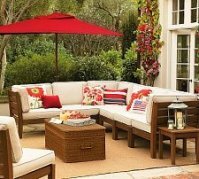 So build as much as you can afford without letting it overwhelm your overall outdoor living space. Don't cover your entire yard, and don't interfere with other backyard components you may want in the future. But allow as much room as your space, your overall backyard plan, and your budget will allow. What shape does your deck need to be? Squares and rectangles are the most common deck shapes, and with good reason. They are efficient designs, both in terms of cost and function. But they can be pretty boring. Those efficiency principals remain true if you join those shapes together, like an "L" shape. You're still dealing with basic straight lines, but the shapes get much more interesting if you put them together like blocks. You may also consider building those "blocks" on different elevations. Even a one step drop from one section to another can make a dramatic difference, for very little money. 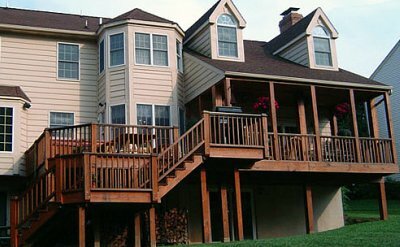 Multi-level decks can create a "sectioned off" feel, so you can almost have seperate rooms while keeping everything open. So you don't have to build a round deck in order to have an interesting shape. Rounded decks are great, but they ain't cheap! An "in-between" idea is to use angles. You'll add some cost, but as long as you don't get too carried away, it isn't that much. What materials will you use to build your deck? There are a number of great materials you can use to build your deck. And there are even more options when you start planning your deck railing. The differences between the materilas are essentially longevity, maintenance, appearance, and cost. Read here to learn much more about material options. Once you have answered these questions - How big? What shape? Which materials? - we can get started with the cool deck design tips below. After going over these tips, come back to these basic questions and see if they need to be modified. You may even have to start over with a different design. But this is the thought process you need to go through to end up with that dream deck. So let's get going with the cool stuff. As you go through these tips, click on the highlighted links for additional information on various topics. Here we go! Your next step is to check out the first five great deck design tips! Backyard Design Ideas - Proudly serving the Lake Norman area of Central North Carolina including the following towns and counties; Mooresville, Troutman, Charlotte, Statesville, Mt. Ulla, Mt. Mourne, Davidson, Huntersville, Denver, Iredell County, Mecklenburg County, Lincoln County, Cabarrus County, Catawba County, Rowan County. Call us today for a free estimate. 980-722-7370. Simply The Best. 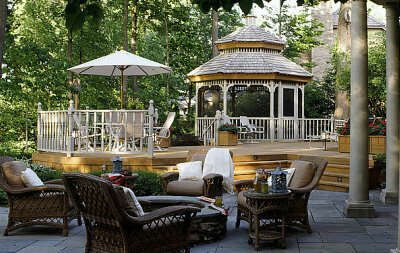 Camino Construction Servicesis the best source for decks, porches, gazebos, whatever your outdoor construction needs may be. 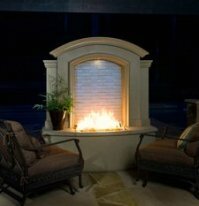 In central North Carolina, they are the recommended builder of Backyard Design Ideas. Give them a call - 980-722-7370. All of the information and ideas provided here are free to you. If you would like to help us keep it free, consider a donation. Any amount is greatly appreciated, although donations over one million dollars will get you a personalized note of thanks! Anyway, if you want to help, just click the button below. Thanks! Grills - Which Is Best? Deck Materials - What Is Best? 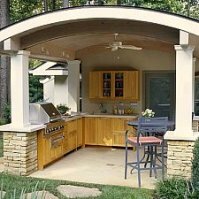 Backyard Design Ideas - Proudly serving the Lake Norman area of Central North Carolina including the following towns and counties; Mooresville, Troutman, Charlotte, Statesville, Mt. Ulla, Mt. Mourne, Davidson, Huntersville, Denver, Terrell, Stanley, Concord, Salisbury, Iredell County, Mecklenburg County, Lincoln County, Cabarrus County, Catawba County, Rowan County. Call us today for a free estimate. 980-722-7370.